Can exercise help the brain? This was the topic of a recent lecture by John G. Ratey, MD sponsored by PEN. First of all let me tell you a little bit about PEN. The acronym stands for Parents Education Network, a coalition of parents collaborating with educators, students and the community to empower and bring academic success to students with learning and attention difficulties. Now to John Ratey. Well, all I can say is that I wanted to jump up and cheer, “Yes! yes! yes!” because what he is promoting (real exercise that’s fun to do) is exactly what helped me. My mother enrolled me in an exercise program when I was eleven. I loved it. My brain cleared and exercise made it easier for me to study. This is a fun discipline I have continued since that time. Well, Dr. Ratey and many others are working with school systems in the US to get this concept across. And it’s working. No, the exercise is not football, nor tennis, etc, its 40 minutes a day doing one or more of aerobics/boot camp/ hip hop/games etc, etc. They have discovered that play is an important component to academic learning. Here’s what happening in schools that incorporate fitness-based programs. Test scores go up, especially in math and language arts. If you want to learn more go to www.JohnRatey.com. He has many books, but it seems that SPARK, “the new revolutionary science of exercise and the brain,” is the book that has the most details on this approach. If I were a teacher or a parent, I would hasten to the bookstore to learn more. I know that his approach works. 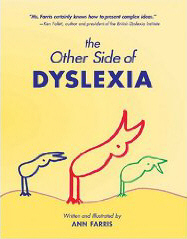 I am both dyslexic and hyperlexic and his approach has worked for me. By the way, Dr. Ratey is a clinical associate professor of psychiatry at Harvard Medical School. Finally, I will continue to evolve this site, including incorporating dyslexic and/or hyperlexic information that others have to share. Yes, I am looking for your ideas. Send them via the Comments. below.